Sneakers and the statement jackets are always top on the preference list of men. A right pair of trousers is an undoubtedly an essential item in men’s wardrobe. There are some trouser styles that you may not have considered till now as you never knew about them. These trouser styles can become your latest style statement. 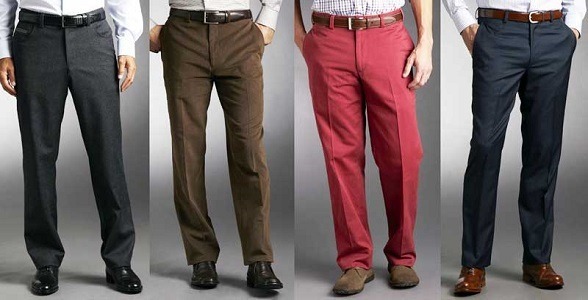 This is a guide which will give you a complete idea about varied trouser styles available in the market. Corduroy trousers: These trousers are made out of cord which is composed of woven, twisted cotton or wool forming parallel lines. This is one of the most durable types so they can withstand rough and tumble situations easily. It looks brilliant when dressing down and worn casually with a sweatshirt and leather sneakers. You can search for a pair of these trousers from Polo big and tall clothes. It will really add up to your personality. Twill chinos: These trousers are from the era when jeans were not the king. It is made out from heavyweight cotton that is woven to create diagonal parallel ridges. Twill is highly durable material so it provides you excellent cost per wear calculations. You can wear them with an easy-going pair of shoes, a T-shirt or a denim jacket for a cool look. Cropped trousers: They are also known as ankle swiggers as it allows your ankles to breathe in summer. It is a great way to style when you are bored with formal outfits. Cropped means shorter than your average not to be mistaken with pantaloons. These trousers even highlight your footwear. It goes well both with formal and casual attire. Cargo pants: Starting from army essential to the noughties oversized monstrosity, cargo pants have a deep history. You can check out in polo big and tall clothes collection for a good pair of cargo pants for your wardrobe. These pants can be paired with just anything like an overshirt, grey sweatshirt or a navy overcoat whichever you want. High-waisted trousers: The popularity of high waisted trousers is increasing. A well-styled pair can provide you a great look. While tailoring these trousers you must be clear about the length and cut. If you want wide-leg style, then you will need a cropped fit which ensures that you are not drowning in the fabric. Pair it up with a fitted or loose T-shirt and layer with a matching unstructured jacket or a woollen overcoat for a complete look. Tracksuit bottoms: When it about tracksuit bottoms then there are various designs available. You can choose a side-stripe trouser style or you can go full nylon. Irrespective of the style you must always choose the slim cut and if elastic is not present in the cuff then you can opt for a slightly cropped leg. Usually, these are paired well with sportswear. These are some options for trousers that you can consider and purchase for your wardrobe. A pair of trousers was a tradition that is coming back in the latest trend.